In October 1899, tens of thousands of Boer horsemen poured over their borders, sparking the Boer War by invading the British territories of Natal, Cape Colony, Bechuanaland and Rhodesia. The long hoped for, and openly stated, aim was to drive the British from Southern Africa. Overwhelming the outnumbered and unprepared colonial garrisons, the invaders pushed forwards, annexing the land they grabbed, looting villages and farms, renaming towns and introducing their racist laws. Over a century of propaganda first by frikaner nationalists, then by the Apartheid regime and now even by the ANC government has reinvented these invasions, styling Kruger s republic as the innocent victim of British aggression, desperate only to preserve their independence. Released in 2014, Kruger Kommandos & Kak exploded onto the scene to shatter these and many other long-cherished myths of the Boer War. This updated and greatly expanded edition builds on this, and will prompt the intelligent and open-minded reader to re-evaluate everything he thought he knew about the conflict. 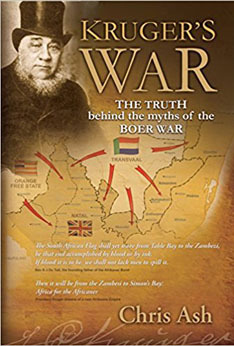 Uncomfortable reading for some, Kruger s War tells the truth of the Boer War the side which the Apartheid regime s propaganda machine did not want you to hear.